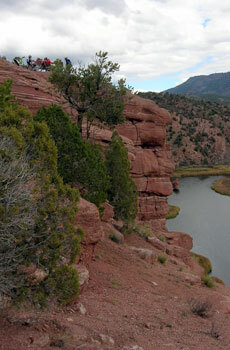 Due to other business and time commitments, Rockymtnrides.com will not open for the 2013 season. Rocky Mountain Rides is nestled in at 7,000 feet above sea level at the foothills of Pikes Peak; just minutes from some of the best off road motorcycle riding in Colorado and the USA. Whether dual sport or extreme dirt bike riding, Rocky Mountain Rides will guide your tour of spectacular, diverse terrain that the Rocky Mountains offer. 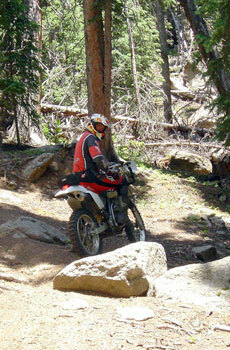 Guided Motorcycle Ride Packages are offered throughout the Northern, Central, and Southern Colorado Rocky Mountains. 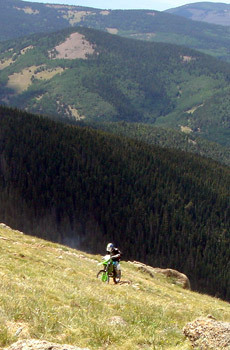 The Rocky Mountains offer terrain and trails that must be ridden by a dual sport dirt bike to believe the experience. It will be the ride of your life every time you ride with Rocky Mountain Rides!